Today I awoke to a parcel being deliver, always a good start to the morning even if I didn’t have any idea what it was. Opening it reviled some beautiful turquoise tissue paper and the BeautyHeaven logo, so I’m assuming that this is my gift for being one of the first 400(?) to fill out their survey. Yay! 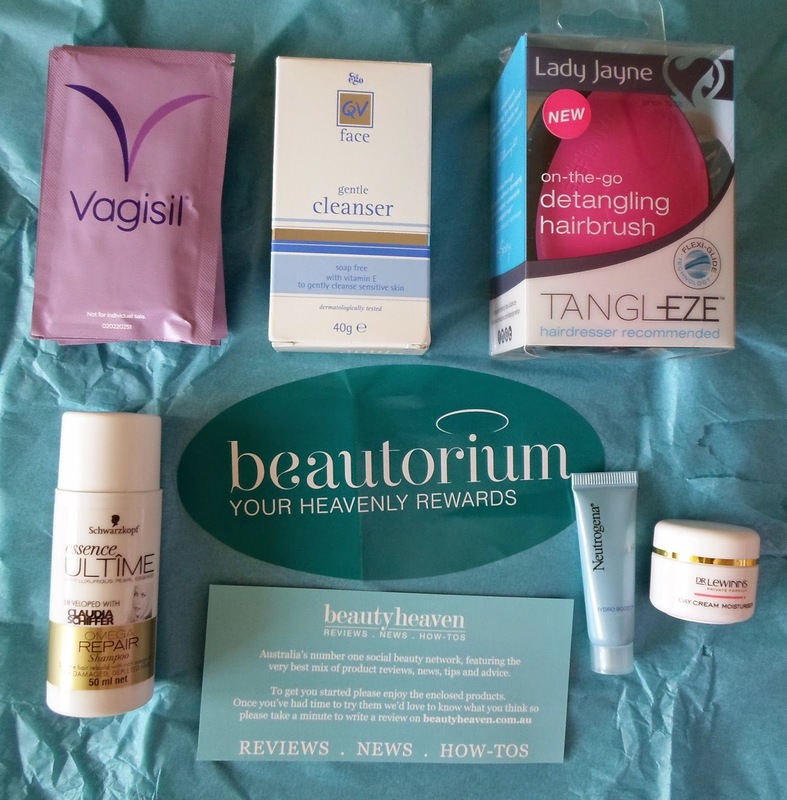 First up if you are an Aussie into beauty and never have checked out BeautyHeaven, I suggest you pop over for a look. It’s a website that covers everything to do with beauty. There is beauty news, products reviews, articles, competitions, a forum with a great community and opportunity’s to try and review products. I’ll quickly go over what I got in this bundle. This is the product I’m most excited about; not only have I wanted to try one of these detangling brushes but I’ve been looking for a travel brush, too. Lady Jayne may not be the most fancy or expensive hair accessories brand, but I find them affordable and reliable. Since I got this first thing in the morning I gave it a go in my sleep-induced-birdsnest-hair (I blame the Hair Pixies who also steal bobby pins and hair ties). I found it worked a treat to cut through the knots and left the hair smooth and silky. A common soap free cleanser, I’ve often seen it about but I’ve never tied it. It’s come in a cute little 40gm travel size and I’ll be happy to give it a try. This should be good for those days where my skin is being contrary and feels extra sensitive. I received one of these from Beauty Heaven when I first signed up and quite liked it. However I’ll be passing this on to my mother since she really does love the brand. The only let down is that it doesn’t contain an SPF, which I prefer from my day creams. I’ve seen this 50ml travel size shampoos floating around Priceline and recently bought one of the Shine ones to bring up my purchase total. I’m not that fussy when it comes to shampoo and conditioner and I love to try new one. However I do like to match shampoo with conditioner so I may have to see if they have the travel conditioner in travel size at Priceline. Quite shocked to so that there are actually six of these individual wipes. It’s not a type of product I normally use, but I’m sure I’ll find something to do with them. A sample pack makes a great start to the day and I love the range of samples from popular brands. An extra benefit of these travel size products is that I’m off to IMATS this weekend, so these will make a great addition to my overnight bag. Have you tried any of these products or where you also lucky enough to win this package; I would love to hear your thoughts.